I misplaced my SD card and SD card reader and hence no photos.... and my lack of blogging! Despite this, we have been very busy! With orders of new products and making our own things! We had our first Saori weaving class last weekend, and everyone loved it. Here is one picture of a finshed piece, I love it! 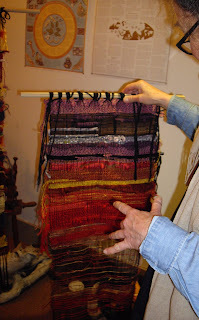 I did love the saori weaving workshop!! Some of your 'wildly wonderful' spun yarn got used in my piece - could not resist - meant for it. And I look forward to a session of 'anything and everything goes' (into it) carding and then turning it into yarn on the rakestraw spinner. Won't that make a unique moebius. I love that your 7yr old is spinning! My *nearly* 4 yr old loved helping you with the crazy carding and is dying to go back to see you again! He wants me to bring my country spinner to show you so we can spin more fibre! Maybe a kid's spinning class could be in our future!?! ?